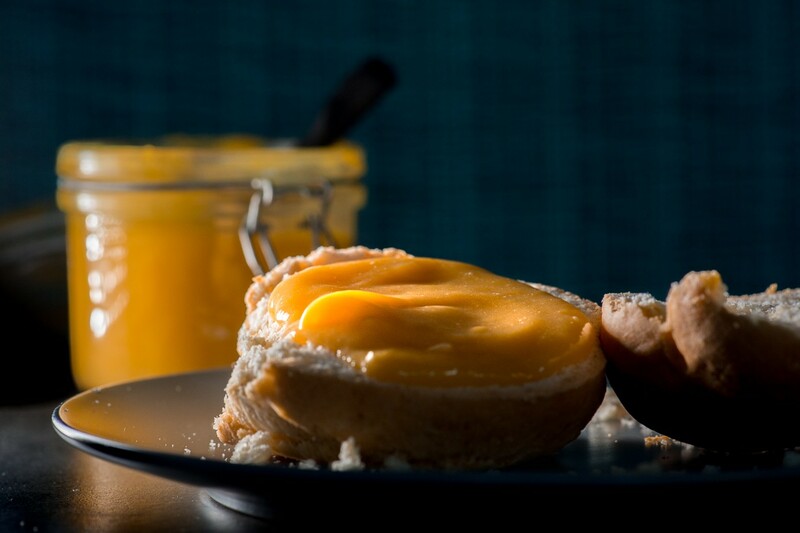 If you love lemon curd, you are in for a treat! This fruity clementine curd has all the sharpness and tang of a lemon curd, but with the extra juicy flavour of a clementine. (In case you’re wondering, a clementine is a cross between a naartjie/tangerine and an orange). 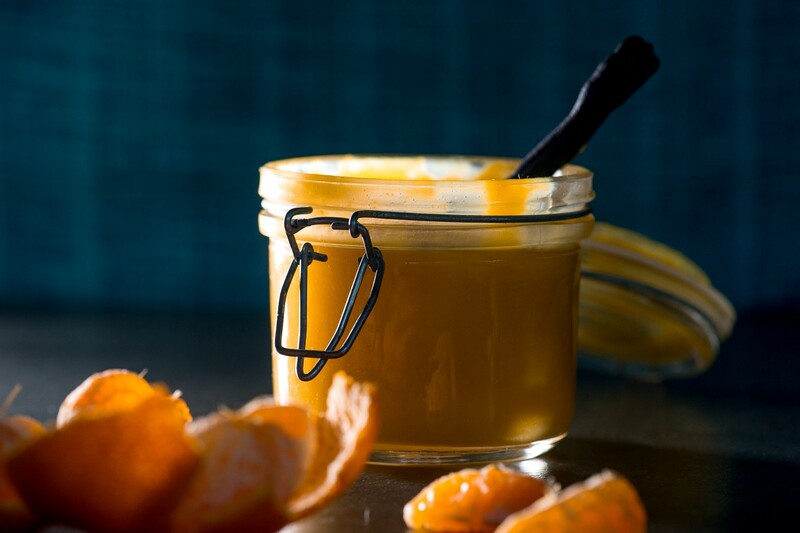 Just like lemon curd, clementine curd has a host of delicious uses. Although it seems rather liquid when you fill your jars, it sets into a thick, almost custard-like texture – ideal for spreading onto scones or pancakes. 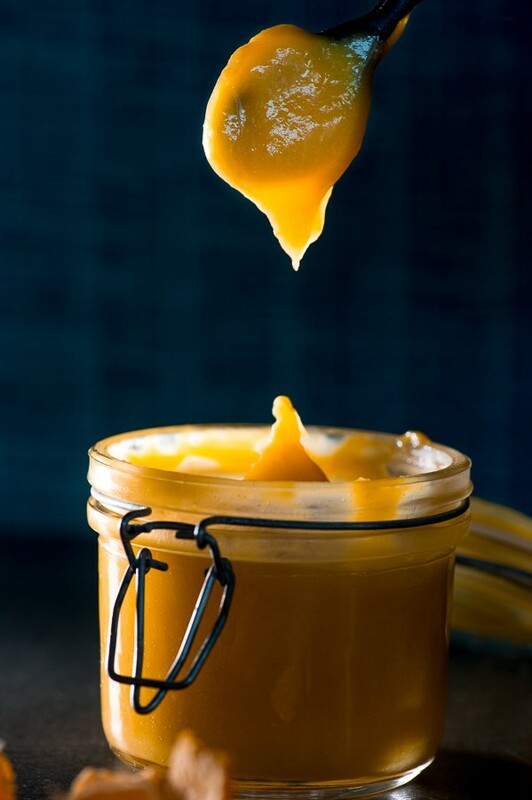 Warm the clemetine curd slightly to use it as a sauce or drizzle in desserts. For more ideas on how to use it, read here. To sterilise your jars, wash them in very hot, soapy water or run through the hot cycle of a dishwasher. Place the wet jars onto a baking tray and place into an oven at 160°C for 10-15 minutes. If you are using jars with screw-top lids or rubber gaskets, don’t dry the lids or gaskets in the oven – just air-dry them in a colander after boiling. Zest the clementines, then squeeze the juice and measure out 150ml. Add the clementine juice and zest to a heatproof bowl together with the lemon juice, butter and sugar. Place on top of a pan of simmering water and whisk until the butter has melted. Now add in the beaten egg yolks, and continue heating gently and whisking continuously. It will take 25-30 minutes of heating and whisking until the mixture thickens and coats the back of a metal spoon. Remove the mixture from the heat and immediately strain into a jug. Pour the mixture into your sterilised jars, leaving a 1cm headspace. Allow the jars to cool to room temperature before refrigerating. The curd will keep unopened for about 2 months in the fridge or 3-4 months in the freezer.